Magnesium is the ultimate ‘chill pill’ and the wonder supplement everyone should have in their medicine cabinet – just like my granny did with her ‘Milk of Magnesia’ and Epsom salts. It is needed for more than 300 biochemical reactions in the body. It keeps our heartbeat steady, supports our immune system, maintains normal nerve and muscle function, regulates blood sugar levels, helps us sleep, reduces inflammation and prevents stress hormones from entering the brain. Although a vital nutrient for regulating metabolism (that controls weight) and mental health, a staggering 80 per cent of those eating a typical Western diet are deficient in magnesium. The RDA for an adult is between 320mg and 450mg per day, yet studies show most of us only consume 250mg – far lower than the amount our body needs for optimal physical and mental health. Our ancestors would have consumed plenty of magnesium in seafood, organ meats and by drinking water straight from the stream or absorbed through the skin when swimming in the sea. But our diet and activities are very different today. Due to intensive farming soil is depleted of minerals, tap water has been stripped of magnesium during processing and we’ve swapped the liver and onions or steak and kidney pie for processed foods containing little or no magnesium. Modern dwarf wheat strains which make up so much of the Western diet contain far less magnesium today than the einkorn wheat my granny ate. To make matters worse, millions of us regularly take antacids which further deplete magnesium in the body. As a result, we simply aren’t consuming enough magnesium and it is a major contributing factor to the mad fat epidemic. Doctors first became aware of magnesium as an essential mineral for mental health in 1968 when Warren Wacker MD and Alfred Parisi MD published their paper in The New England Journal of Medicine. Their research showed that magnesium deficiency could cause depression, psychosis, irritability, seizures, behavioural disturbances and headaches – all of which could be easily rectified by taking more magnesium. Today, progressive medical doctors, such as Dr Carolyn Dean, are starting to treat patients with magnesium. In her book, The Magnesium Miracle Dr Dean lists 56 different health conditions that research now indicates are associated with magnesium deficiencies including Alzheimer’s, depression and diabetes. Studies have also shown it combats everything from heart problems to osteoporosis, stroke and memory loss. It’s the little white pill we should all be taking – especially if we are mad or fat. It is especially important if you also smoke. Magnesium has been proven to markedly improve lung function and studies show it helps to repair DNA in the lungs. This may go some way in explaining why my granddad lived to a ripe old age despite puffing away on full-strength cigarettes most of his life. His regular baths in Epsom salts and drinking Andrews liver salts probably extended his life without him even knowing it! Magnesium also helps combat respiratory disorders and is often used by progressive doctors to treat asthma and other conditions. Calcium competes with magnesium in the body as both minerals bind to the same membrane sites in cells. When we consume a lot of calcium and not enough magnesium this imbalance can kick-start a whole host of health problems including mental illness and obesity. Don’t get me wrong, the body absolutely needs calcium (it’s the 5th most common element in the body) but the secret to balancing these two minerals lies in understanding how they are absorbed and monitoring how much of each you consume in your diet. The body tends to hold on to calcium by either storing it or recycling it, so even though we have a greater need for calcium it is harder for us to become deficient. That said, even if we have a plentiful supply of calcium it cannot be absorbed without magnesium and the body will draw magnesium from bones, organs and tissues to help balance the calcium. This can lead to a magnesium deficiency because, unlike calcium which is easily stored and recycled again and again, magnesium is used up or excreted and must be replenished on a daily basis. This is why so many of us are deficient in magnesium. We need regular top-ups in our diet and if we are not eating foods rich in this magic mineral every day or taking supplements then we soon run out. The way that vitamins work is interconnected. How well one works depends on the amount of other vitamins and minerals in the body – so if you are deficient in one it can have a knock-on effect on the other. If you are not currently eating a diet full of dark leafy green vegetables, nuts, seeds, fish, beans, whole grains, avocados, bananas and dried fruit, but are regularly adding cream to your coffee, milk to your tea and on your breakfast cereal, cheese on pizza, parmesan on pasta and enjoy pots of yoghurt then your calcium to magnesium ratio is probably out of kilter. If you are eating a typical Western diet there is a good chance you are consuming far more calcium than magnesium and you absolutely must take a supplement to balance this out. Another thing to consider is that calcium is often added to food products like breakfast cereals, fruit juices, crackers, antacids and many other processed foods. It is important to read the label carefully to see what foods are fortified with calcium. Magnesium also competes with fluoride in the body and will decrease absorption of fluoride when taken at the same time. This is good news for everyone who has fluoride added to their tap water because magnesium helps to minimise the negative impact of this bad halogen. The body typically absorbs between 20 per cent and 50 per cent of ingested magnesium so it is important you buy the best bioavailable supplement you can. Magnesium supplements are typically available as magnesium oxide, magnesium gluconate, magnesium chloride or magnesium citrate. Magnesium oxide tablets are the variety most frequently sold in supermarkets and pharmacies but they are poorly absorbed by the body. As a result you will need to take more tablets to ensure you are getting enough magnesium. It is often a false economy to purchase these cheaper tablets. Plus supermarket supplements often contain fillers and other unwanted ingredients and the elemental magnesium content can often be very low. 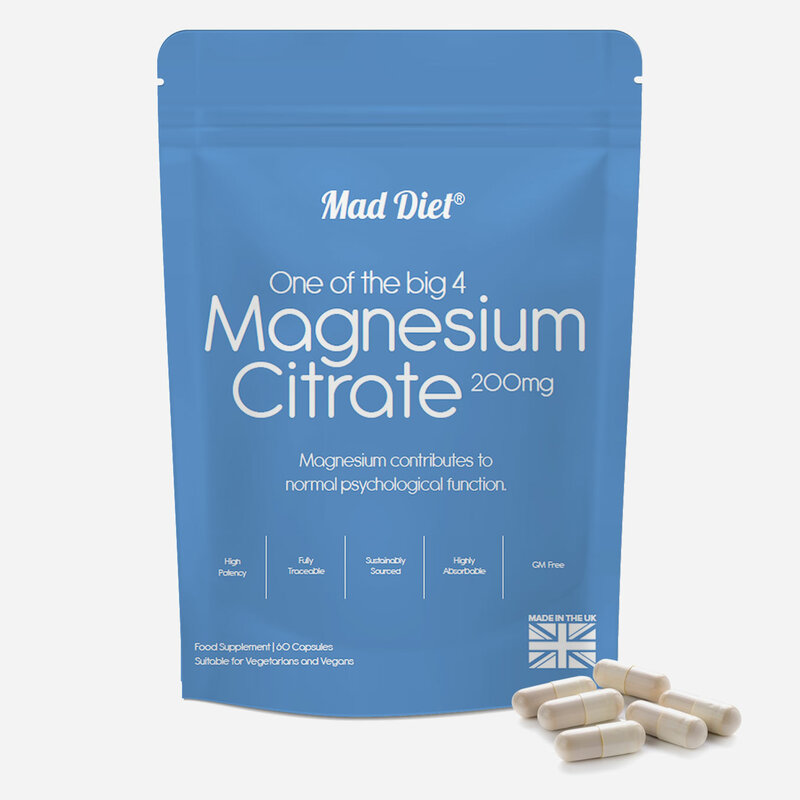 By far the best supplement to take is magnesium citrate. It contains citric acid which is a mild laxative so a perfect choice for those of us with colon or rectal problems which are often associated with being overweight or obese.